CRS envisions a coffee sector that is centered on smallholder coffee growers who are profitable, coffee farmworkers who are empowered, and coffee-growing landscapes that build natural capital, mitigate the impacts of climate change and deliver more clean water to communities that lie downstream. It is a vision that depends on public sector policymakers and private-sector practices that make the coffee trade more inclusive, more equitable and more ecological. But there are complex challenges and dynamic forces shaping our programs on the ground. This session will explore CRS' work in the coffee sector in the field as well as the challenges raised by several academics who study the issue. Learn about the CRS Coffeelands Program, a global effort to pursue our vision for the future of the coffee sector: smallholder coffee growers who are organized, profitable and resilient; coffee farmworkers who are dignified, engaged and empowered; and coffee-growing landscapes that build natural capital, mitigate the impacts of climate change and deliver more clean water to communities that lie downstream. Examine the global supply chain process that brings coffee to our cup and hear academics who raise challenges with fair trade coffee. Analyze the impact of fair trade coffee programs on poverty reduction. International Development expert, Michael Sheridan, discusses fair trade coffee as a tool to alleviate poverty in Latin America. Michael shares insights for how CRS has expanded and evolved our work in the coffee industry to provide small-holder farmers and co-ops access to markets and a environmentally sustainable enterprise. 16 minutes. Michael has been kicking around the coffeelands since 1995 and working on coffee for CRS since 2004. In that time, he has worked from CRS HQ in Baltimore, where started the CRS Fair Trade Coffee program(2004-2007), Guatemala City, where he worked on the CAFE Livelihoods and CUP projects in El Salvador, Guatemala, Mexico and Nicaragua (2007- 2011), and Quito (20011-2015) where he led the Borderlands Coffee Project in Colombia and Ecuador, as well as other special CRS coffee initiatives. Currently Michael serves as the Director of the CRS Coffeelands program. He is a member of the SCAA Sustainability Council, a Pittsburgh Pirates fan, a graduate of Georgetown (BS) and Princeton (MPA), and an avid home-roaster who shares his home with his wife, three kids and a pug. A conversation with five women who are among the best thinkers (and doers) on sustainability issues in specialty coffee, by Michael Sheridan. This blogpost, published on April 28, 2015, features comments from executives from Farmer Brothers Coffee, S&D Coffee, Starbucks, Counter Culture Coffee and Volcafe. Coffee. What Difference Does Policy Make? In this blogpost published on February 26, 2015, Sheridan argues that regulatory and policy changes at origin and in the marketplace should be on the list of topics for discussion given their implications for ongoing commercial operations as well as the economic, social and environmental impacts of the coffee trade. In this October, 16, 2014 blogpost, Sheridan interviews Specialty Coffee Association of America’s Executive Director Ric Rhinehart about comments he made a week earlier at an industry conference, Let’s Talk Coffee, and their implications for growers, governments and coffee industry. In this blog, published April 7, 2014, Sheridan shares his insights that farmers’ behavior at the source are influenced, in whole or in part, by the incentives the market creates, or doesn’t. Beginning with the statement “It seems 2015 is shaping up to be the year of gender equity in specialty coffee” Sheridan discusses, in his February 10, 2015 blogpost, the six lenses on gender that inform CRS in its work and may be helpful as the specialty coffee community gets to work on the issue of gender equity in coffee. In this 12-page article from the January-February 2016 issue of Roast Magazine, Michael Sheridan addresses a glaring gap in most contemporary approaches to fairness in the coffee trade: farmworkers! Millions of men, women - and yes - children toil, mostly invisibly, in coffee fields, living on the margins. They are “largely excluded from coffee’s promise.” In addition to discussing the ‘who, what, and when’ of the problem, Sheridan proposes four reasons why the specialty coffee industry should deepen its relationship with farmworkers beyond just insuring compliance with local labor laws. Proactive engagement with suppliers at the ground level is needed to identify the breakthrough solutions. A small-scale farmer from El Salvador explains the difference between fair trade and conventional markets and the importance of being able to negotiate prices - a two minute video by CRS Fair Trade. A video by Equal Exchange. This 3-minute video shares the human faces of farmers who are the fuel of Fair Trade supply chains. By CRS Fair Trade. 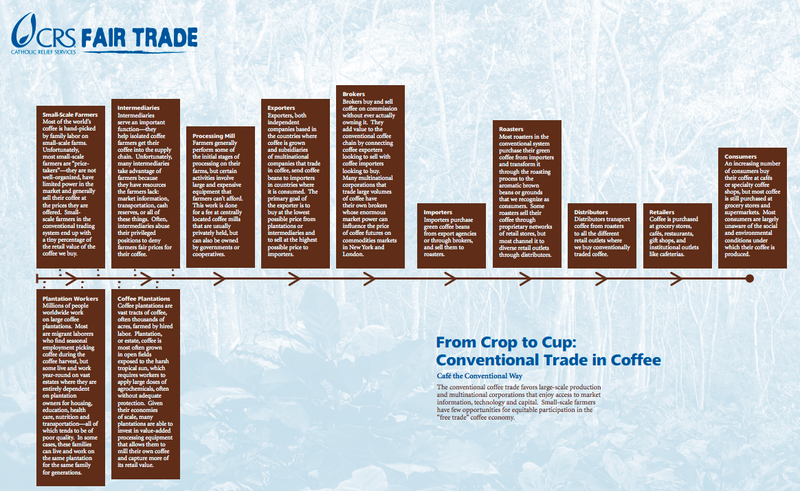 This 2-pager lays out the supply chain for coffee, first looking at the conventional chain and then the Fair Trade chain. The website page published by Verité provides a perspective on the problems of forced and child labor in the production of coffee and includes flowcharts of the coffee marketing and coffee value chains as well as a link to its 124-page report, Research on Indicators of Forced Labor in the Supply Chain of Coffee in Guatemala. Bruce Wydick is a professor of economics and international studies at the University of San Francisco. His new book, "The Taste of Many Mountains", is about the lives of coffee growers in Guatemala and the impact of fair-trade coffee and is published by Thomas Nelson (HarperCollins). In his blogpost on Huff Post Food (first appeared on August 7, 2014), Wydick discusses the mixed results of academic research in his analysis of why Fair-Trade Coffee does not work. Commissioned by TransFair Germany and Max Havelaar Foundation Switzerland. 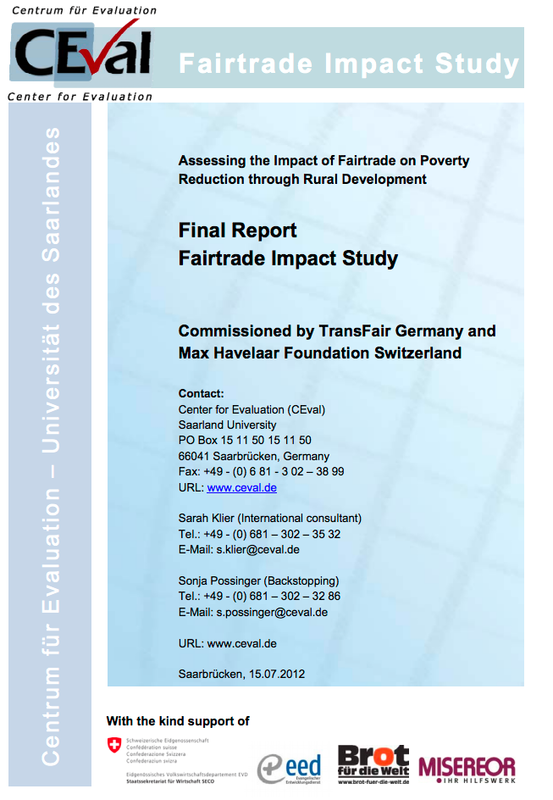 This 95-page report describes the study of six cases of Fairtrade certified producer organizations from six product categories and assesses how rural development – defined by 5 thematic areas – and thus poverty was impacted. Part of the Beginner’s Guide series, Fair Trade: A Beginner's Guide by Jackie DeCarlo is a 192-page primer on Fair Trade. Economic Justice and Fair Trade - A CRS Briefing – Jackie DeCarlo. In this 32-minute video, Jackie DeCarlo, former CRS Economic Justice Manager, addresses how CRS tries to approach integral human development, specifically its work with Fair Trade, from a Catholic social tradition and viewpoint on Economic Justice. Fairtrade America welcomes Pope Francis' message on climate change on its Fairtrade Blog titled “The Pope, Climate Justice and Fairtrade”, published on September 23, 2015. In “Slavery and Commodity Chains: Fighting the Globalization of Indifference” (published in the January 3, 2014 edition of America Magazine), Vincent Miller discusses the structures of indifference that allow for slave labor to exist and provides three responses to fight these injustices. Miller is the Gudorf Chair in Catholic Theology and Culture at the University of Dayton. 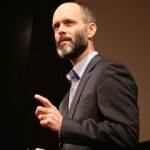 He is the author of Consuming Religion: Christian Faith and Practice in a Consumer Culture and is at work on a book on Christian discipleship and globalization. 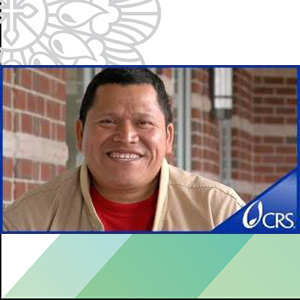 As a member of CRS’ Scholars in Global Solidarity, he visited Brazil in 2013 to work with CRS and its partners on the issue of slave labor. See also the instructor's guide to Keith Brown’s 2010 book Buying into Fair Trade: Culture, Morality, and Consumption. Engage your Campus in Reflection, Education and Action - explore various CRS resources to make your campus a Fair Trade College or University. Michael Sheridan’s blogpost on October 1, 2015 introduces CRS Coffeelands Program. Kelly Miller, American University, authored a case study on July 31, 2009 studying the impact of CRS Fair Trade Fund grants on Nicaraguan coffee farmers. In “Rescuing Colombia’s ‘Golden’ Coffee Beans'” author and CRS employee Robyn Fieser talks about Borderlands, a 5-year project that is helping 3,200 family farmers in conflict-affected communities along the Colombia-Ecuador border. Blogpost published September 11, 2015. In “Restoring Coffee Farms in Guatemala” author and CRS employee Robyn Fieser discusses the impact of coffee leaf rust on families in Guatemala. Blogpost published August 6, 2015. In “Coffee Cooperatives Strengthen Farm Families” author and CRS employee Michael Stulman discusses how coffee cooperative strengthen farm families. Blogpost published August 12, 2015. In “Make Your Coffee Habit Count” author and CRS employee Rebekah Kates shares 10 fun facts about coffee. Blogpost published September 25, 2015. What is CRS Ethical Trade? This link will connect you with resources to help explore how Catholic social teaching relates to ethical trade in more detail.